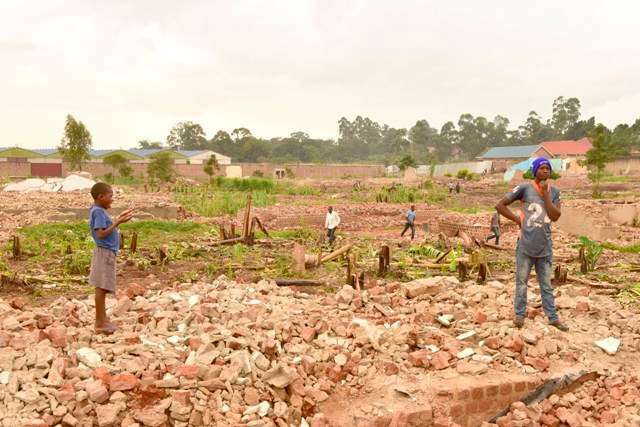 WAKISO – The battle for land between businessmen Medard Kiconco and Lusanja evictees has taken a new twist after the judiciary clarified that police evicted the people illegally quashing an earlier eviction order by the chief magistrate. Mr Solomon Muyita, the judiciary spokesperson said the people of Lusanja were illegally and illegitimately evicted from their land. Mr Muyita while appearing on a local television NBS, said the court order delivered by Nabweru chief magistrate Ms Esther Nasambu was for the land in Ssekanyonyi zone in Mpererwe and not Lusanja. “So the people of Lusanja were illegally and illegitimately evicted from their land,” said Mr Muyita while appearing on NBS December 11. If it is true that the evictions at Lusanja were illegal and illegitimate, then Mr Kiconco, the landlord is exposed to significant liability and possible criminal charges in accordance with the law. Mr Muyita said that the land is private mailo on Block 206 Plot 671 measuring 3.89 hectares (about 9.6acres) in Sekanyonyi Villages in Kawempe Division, Kampala and not in Lusanja, Kasangati Town Council. Last month, labourers hired by a court bailiff and guarded by heavily armed police on behalf of Mr Kiconco stormed Lusanja on the Mpererwe-Kiteezi Road in Kampala and knocked down several buildings, leaving more than 300 families homeless. Mr Kiconco, the proprietor of Lexman Industries, who was the beneficiary of this eviction reportedly bought the land and processed a court order to have people on it evicted. The victims wailed and groaned in pain, stretching their hands to anyone who would care to help them but their outcries fell on the deaf ears of leaders, especially from the constituency, where destruction happened. President Museveni later visited the place and ordered everyone, including displaced persons living in tents, to stay put. The Kasanganti Town Council mayor, Mr Tony Kiyimba Sempembwa, said the residents were surprised when they woke up to find they were surrounded by armed police men protecting civilians armed with hammers ready to knock down their houses yet they have never been served with an eviction order. Some people were seen getting their property out of the houses and those who tried to resist were fed on teargas. Banana plantations and houses were razed to the ground. Ms Rosemary Sseninde, the state minister for primary education and Woman MP for Wakiso district who also visited the area condemned the act describing it as inhuman and order given without visiting the scene. She called on the judiciary to stop issuing eviction orders without visiting the areas where the evictions are to be carried out. Ms Sseninde together with state minister for Lands Ms Persis Namuganza later petitioned Justice Catherine Bamugemerei, the chairperson of the Commission of Inquiry into Land Matters in Uganda to intervene. Justice Catherine Bamugemereire said Mr Kiconco had been summoned to appear before the commission after President Museveni halted any further evictions and destruction of property during an impromptu fact-finding tour of the area. He was accused of defying a directive by the land inquiry which halted implementation of an order from the High Court execution division dated August 23.